The Dynamic Tower, also known as Dubai Rotating Skyscraper or the Da Vinci Tower, is designed by the Italian architect David Fisher and it will finally be built in 2020. The tower measures 1,273 foot-tall and consists of 80-floors. In addition, units will be built on separate floors; each will be rotating independently around the structure's concrete body. The building is made from pre-fabricated units, which will then be attached to the structure's concrete; center, each floor will only take six days to assemble around the core body. The tower is using the most cutting-edge technologies, wind turbines between each floor and solar panels on the roof to help in generating enough energy to fuel the whole building's electricity. 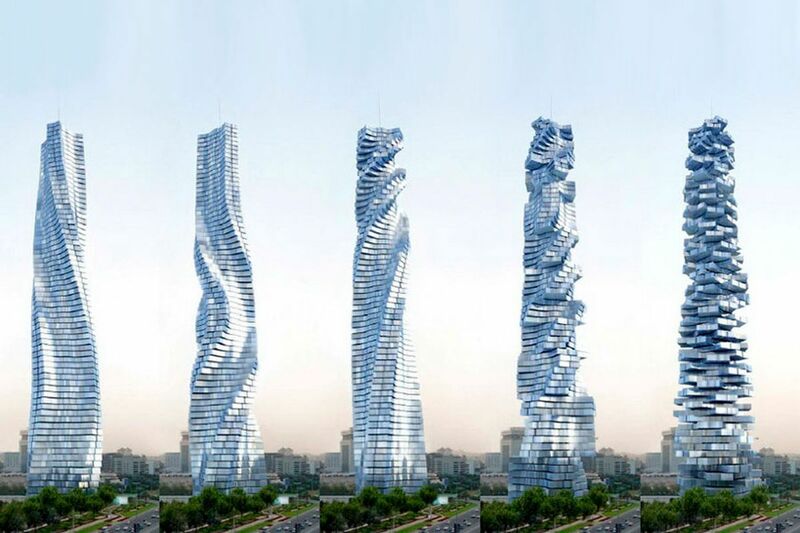 In addition, The Rotating Tower is not only innovative in design and architecture. But, also an eco-friendly building as most of the production materials are made from raw natural materials. It spins an angle of 360 degrees in all directions! The amazing thing that the Tower spins an angle of 360 degrees in all directions! Therefore, the view will change endlessly according to the residents’ needs. However, the tower will also include a private car lift that will allow residents to park their cars in a garage directly in front of their apartments. The units in the rotating tower would cost between $4 million up to $40 million.